The international bee crisis is threatening our global food supply, but this user-friendly field guide shows what you can do to help protect our pollinators. The Xerces Society for Invertebrate Conservation offers browsable profiles of 100 common flowers, herbs, shrubs, and trees that support bees, butterflies, moths, and hummingbirds. The recommendations are simple: pick the right plants for pollinators, protect them from pesticides, and provide abundant blooms throughout the growing season by mixing perennials with herbs and annuals 100 Plants to Feed the Bees will empower homeowners, landscapers, apartment dwellers -- anyone with a scrap of yard or a window box -- to protect our pollinators. From the Back Cover Plant for Pollinators The first simple step toward protecting our pollinators is to provide the flowers they need, using no pesticides. With abundant native wildflowers, your task is even simpler: don't mow them down! 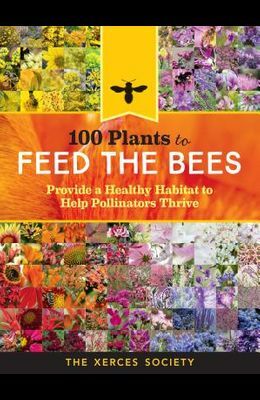 This field guide identifies the plants that honey bees and native bees - as well as butterflies, moths, and hummingbirds - find most nutritious, including flowers, trees, shrubs, herbs, and pasture plants. With guidance from the Xerces Society, the global authority on insects and other invertebrates, you can turn your backyard, farm, or commumity into a thriving pollinator habitat. Each plant profile includes which pollinators visit the plant, the quality of honey the nectar produces, when it blooms, how best to use it in the landscape, planting tips, and spectacular photography.